Here we are at our annual day of giving thanks. As soon as November hits, the stores put up the red and green, but I appreciate a day to reflect on all that I am thankful for. I’m thankful for colors—blues, greens, corals, rubies, golds, browns—oh the richness and variety of browns in the world! I’m thankful for textures—smooth, silky, fuzzy, bumpy, ridged, sharp, soft. I’m thankful for handwork—weaving, spinning, knitting, tatting, crocheting, sewing. But more than all of these, I’m thankful for faith, for family, for friends. And I’m thankful for all of you who read through my occasional musings on fiber art and who have supported my creative jaunts. To share my appreciation, I am offering 10% off on any orders over $75 from my Etsy shop. Just enter the code HOLIDAY18 at check-out. And if you order on Cyber Monday, November 26, your treasures will ship for free. Perhaps you’ll find just the right gift for you or your special someone. Thank you – and Happy Thanksgiving! Two trees, a piece of rope, some clothespins and a warm, sunny day—a welcome treat that harks back to my growing up years in the country. Yes, I hung out the wash! 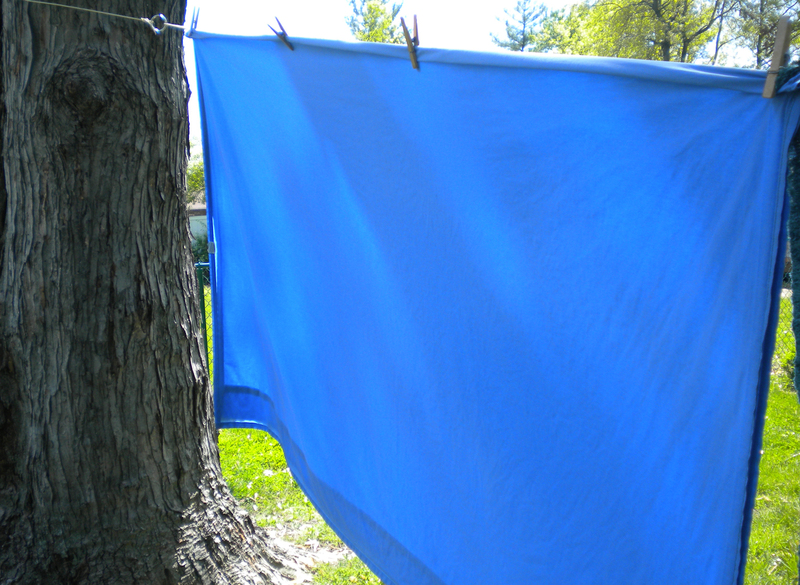 When I was a young mother, we had a real clothes line: two t-poles with hooks for six lines. All the cloth diapers dried outside, letting the sun bleach them white again. The sheets billowed gently in the breeze – or whipped in the wind, depending on the day. The rugs hung heavily from the ends near the posts, with the hope that they would not break the lines. Sometimes the kids would run through the wash, playing hide and seek between the shirts and jeans. It all sounds kind of idyllic now, but at the time, it was just how I learned to do wash. It was a way to save some money, do my little part to help the environment. Nothing romantic about it at all. Those baskets were heavy to carry up the basement stairs from the washer to the line. It took extra time to hang them out, wait for them to dry, then collect them. Laundry took all day. And then if clouds rolled in, there was the dash to the line to collect the clothes before it rained. My mother hung out the wash as did her mother before her. Our line when I was a child was between the house and the garden—another common fixture for rural homes. One of my vivid memories was the spring day my Mom was hanging out the wash and suddenly started calling frantically for my Dad. It seems a family of baby grass snakes hatched under the line that day and Mom didn’t like snakes! Hanging out the wash was not so much a tradition as a necessity. That was how you dried the laundry. But since outside activities have taken over our lives, efficiency means everything and sometimes we just want to get the laundry done quickly. Hanging out the wash becomes a nostalgic luxury. But if you have two trees, a piece of rope, some clothespins and a warm, sunny day, indulge yourself! There’s nothing like the smell of laundry fresh off the line! What are your memories of hanging out wash?